Since 1965, Portledge School, situated on a beautiful Locust Valley campus, has provided an inclusive, dynamic, and collaborative education from pre-nursery through high school graduation. From its championship athletic teams to its professionally staffed music, theater and visual arts programs to challenging academics, Portledge offers a welcoming and stimulating environment that fosters a lifelong love of learning, critical thinking skills, and the development of intellectual courage. The entire Portledge community - faculty, administrators, alumni, parents and trustees - shares its commitment to ensure that every child participates, belongs, and succeeds. 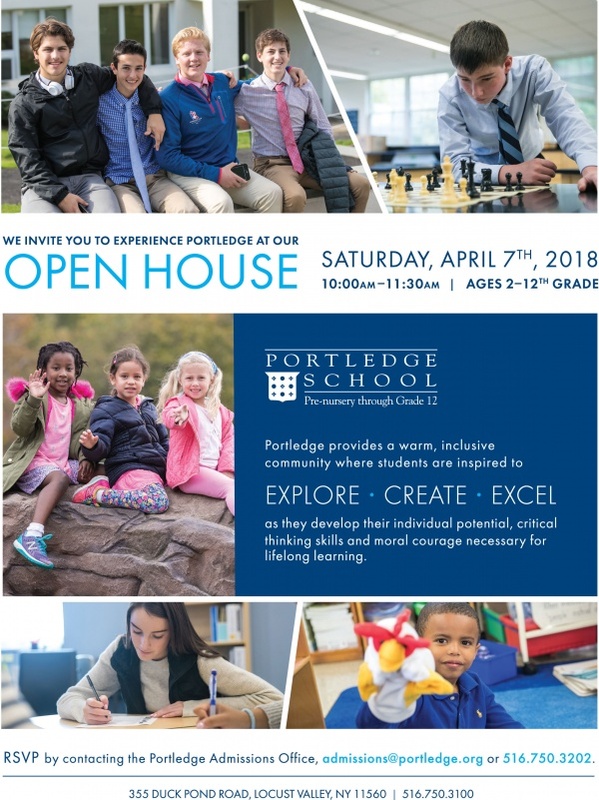 Portledge School is an independent, pre-nursery through 12th grade preparatory day school. The school’s coordinated sequential programs, beginning with the Reggio Emilia program in early childhood, provide a rigorous academic environment, preparing students to live responsible and productive lives. Dedicated teachers use small class size to deliver knowledge based on inquiry and inspired by a student-centered learning approach. Individual talents are nurtured through the arts, athletics, and a variety of community and travel programs that all emphasize the Portledge Pillars of passion, purpose, honor, and respect.